Questions have been raised over the effectiveness of the Aylesbury Transport Plan. AVDC Planning Department have “surrendered Aston Clinton to the developers “, according to residents. Residents have aired grave concerns over the number planning developments in Aston Clinton that have been approved since 2013. There has been a new increase of 36% of dwellings since 2013. Local residents have set up a petition to stop losing the identity of the village. So far, there have been 153 objection letters voices about the development off Land Off Chapel Drive in Aston Clinton, in a growing chorus of discord of people angry with the amount of development occurring in Aston Clinton. Simon Ike, from Aston Clinton said: “Neil Blake, leader of AVDC makes a public pledge that as a consequence of Aylesbury being granted Garden Town Status affordable housing will be a result “Let’s get local people on the property ladder” - I will believe it when I see it, as we have little evidence so far in Aston Clinton. “Where has he been the last three years where so many unaffordable homes have been approved in Aston Clinton? With most new builds in the region of £400,000 to £1m plus, public works are cheap if they are not backed up with reality. “And as he is now showing an interest in housing perhaps he could have a word with his AVDC planning department and ask them to stop overdeveloping the ancient village of Aston Clinton, where we have seen a 36% increase in new homes approved in less than three years - plus another application of a further 250 homes on a green field site pending. All of this without any improvements in infrastructure: Roads, schools, or health facilities. John Disbrey, a local resident said: “It defies all logic. If the same level of development was imposed on every community in the United Kingdom, this would mean building enough homes to accommodate an extra 20 million people. This comes as Kier announce a new development of: “30 three, four and five-bedroom family homes” over 20 acres of land on the northern edge of Aston Clinton. John added: “This community simply cannot accommodate another estate of this size. AVDC has a 5 year Housing Land Supply, so there is no need for this development. Further this site location intrudes into open countryside at the edge of the settlement and risks coalescence with the village of Buckland. “The numbers tell us that AVDC’s planning policy is in total disarray. This situation has been created by central government ideology, plus AVDC’s reluctance to fight planning appeals on the basis of cost. “Although a cynic may argue that when a council spends over 40million pounds on a vanity project like the Waterside, there will be no money left over to fight planning appeals and defend local communities from the speculators. “The application for 250 dwellings at Gingers Farm, Aston Clinton, was submitted to AVDC in November 2016. It is still at the stage of awaiting key consultation responses so the council is not currently in a position to take a view on the application. “We are currently working on an emerging local plan for the future growth of the District. The plan will include provisions for meeting the needs for specific groups of residents; including first time buyers, those who require affordable homes and the elderly, as well as all other demographics. 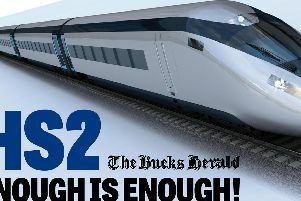 Hampden Fields Action Group have commissioned a review of the draft Aylesbury Transport Strategy produced by the Bucks County Council and AVDC questioning the effectiveness of the proposals. Last year Aylesbury Vale District Council and Buckinghamshire County Council revealed their plans to develop roads and infrastructure around Buckinghamshire with cycle paths, rail links and bus networks to improve the way people travel through Aylesbury. A public consultation on the strategy has been running over the Christmas period, and ended last week. The £5000 crowd funded report, commissioned by the action group, has pointed out a number of ways in which they think the project is set to fail. Phil Yerby, a spokesman from the group said: “I realise the council are trying to put a positive spin on things but the reality is a town drowned in traffic with very poor air quality that will lead to economic disaster - who are they trying to fool? “It’s obviously very important that we get this right. “What this independent report shows is that if you want to put 15,854 houses around Aylesbury, you can do it, but you can’t do it without making traffic significantly worse. “People sit in traffic coming into Aylesbury, not because they want to bypass Aylesbury, but because they want to get into the centre. Therefore a bypass is going to be ineffective. “We are in a really serious situation here. I won’t say it can’t be done; it can be done, but if the council push on, we can almost guarantee that we’re going to have traffic jams like you get in Hong Kong, Taiwan and Bangkok. Two road side interviews have been conducted for the Aylesbury Transport Model, which asked commuters where their journey begins and ends. “There needs to be a lot more of these road interviews done, because those were only on two access points into Aylesbury. “AVDC and Bucks County Council have been pushing a change to get us to cycle and walk over the last 10 years but no discernible shift has happened. We approached Bucks County Council, and Cabinet Member for Transport there Mark Shaw said he welcomed all 250 responses to the consultation, which included a report from the Hampden Fields Action Group. “All these responses are important, and I’ll be looking carefully at the details with the team. Cllr Carole Paternoster, AVDC Cabinet Member for Growth Strategy commented: “The Aylesbury Transport Strategy is part of an overall integrated transport and land use strategy within our draft local plan: “Aylesbury is to take 15,000 houses as part of our district’s housing growth and half of those have either already been built or are committed with appropriate transport improvements incorporated. We’re working with our colleagues at Bucks County Council to ensure transport links in and around Aylesbury are appropriate now and in the future”.